Sweden released on Sunday a grainy photo of a mysterious vessel in Stockholm’s archipelago, as the military hunted for a foreign submarine or divers in the country’s biggest such mobilization since the Cold War. 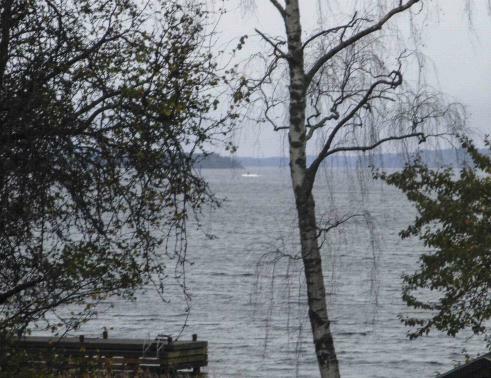 This amateur photo made available on Oct. 19, 2014 by the Swedish Defense Ministry shows an object (top C) in the sea near Stockholm. Sweden released the grainy photo of a mysterious vessel in Stockholm’s archipelago, as the military hunted for a foreign submarine or divers in the country’s biggest such mobilization since the Cold War. The search in the Baltic Sea less than 30 miles from Stockholm began on Friday and reawakened memories of the final years of the Cold War when Sweden repeatedly sought out suspected Soviet submarines along its coast with depth charges. The Swedish armed forces have consistently labeled their hunt one of investigating “foreign underwater activity” but elaborated on what that might entail on Sunday. Grenstad said the sightings had taken place in “an area that is of interest to a foreign power,” but added he was not in a position to link the observed activity to any particular nation. “This does not belong to us. It is a foreign vessel and we have no indications that there would be any civilians involved in underwater activity,” he said. The incident comes amid rising tension with Russia among the Nordic and Baltic states — most of them European Union members — over Moscow’s involvement in the Ukraine crisis. Finland last week accused the Russian navy of interfering with a Finnish environmental research vessel in international waters. Reported sightings of one man dressed in black wading through waters led to speculation [guesses] of Russian special forces in the archipelago, normally a popular holiday destination consisting of thousands of small islands. 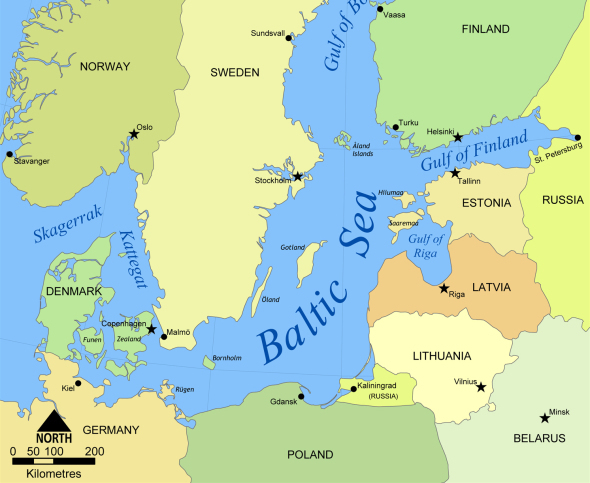 Countries in the Baltic Sea region have become increasingly wary of Russia’s military ambitions since Moscow annexed [took over] Ukraine’s Crimea region in March following the overthrow of Ukraine’s pro-Moscow president by protesters. 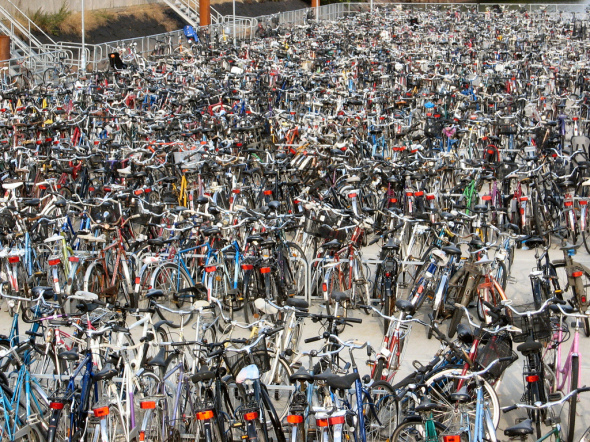 Copenhagen is one of the best places in the world to be a cyclist but there is a downside – thousands of parked bicycles. Sometimes it gets out of control. The number of city dwellers who commute by bicycle is above 50%, and a recent survey suggests that even when you add in people who start their commute outside the city 41% arrive at their place of work or study [by bike]. There are more bicycles in Copenhagen than people, five times as many bicycles as cars, and [about] 250 miles of cycle lanes – not shared with cars or pedestrians – for a city of about 600,000 people. Cycle parking is a shambles here. Outside the main train stations, piles of bicycles clustered around the racks look like they’ve been thrown down by someone on the run from the law. Elsewhere, bikes are often parked randomly on the pavement, taking up pedestrian space and blocking entrances to shops and restaurants. For many non-cyclists, it’s a constant source of irritation. Niels Jarler, a non-cyclist in his 30s, says he often has to walk on the road to get to his flat [apartment] in central Copenhagen at weekends, the pavement is so cluttered. Although theft is a risk – almost 18,000 bicycles were stolen in the city last year – owners rarely chain their bikes to anything. Often they are just stacked one against another. While this may mean there is a low probability that your bike is the one that gets taken, untangling [it] from the dense web often requires vast amounts of patience. One of Copenhagen’s problems is that it has been growing rapidly. About 12,000 people are moving to the city each year, while only 7,000 new cycle parking spaces have been created over the last eight years. 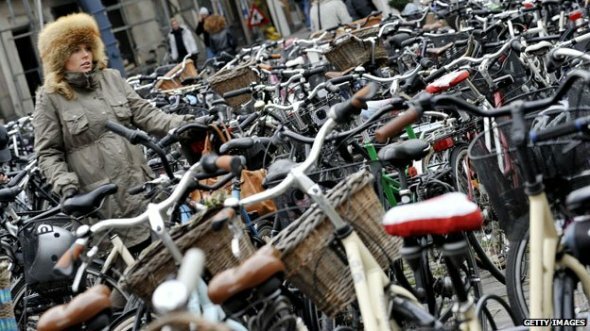 “Many of these newcomers are cyclists, and the city authorities just can’t keep up,” says former deputy mayor Klaus Bondam, who leads the Danish Cyclists’ Federation. Small groups of Syrians are hunting down Islamic State [ISIS] fighters in one of their main strongholds in eastern Syria in a new guerrilla campaign that has emerged as a response to the Islamists’ growing brutality. The main aim is to generate fear in Islamic State’s ranks, said the head of “White Shroud” – a group that says it has killed more than 100 Islamic State [ISIS] fighters in attacks in Deir al-Zor province in recent months. 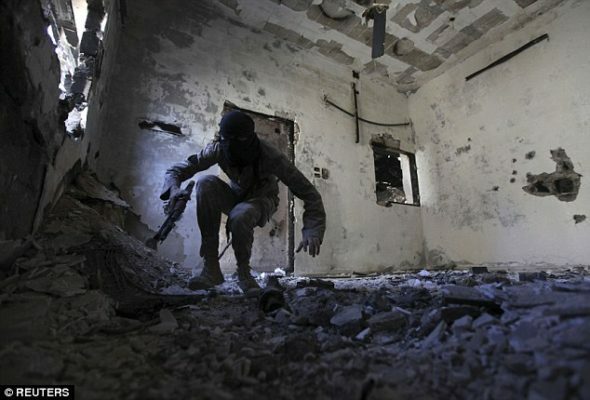 A White Shroud guerrilla fighter crouches down inside of a war-torn house in the Syrian province of Deir al-Zor. More guerrilla groups are starting to attack Islamic State fighters in retaliation for the group’s brutality. The name reflects that aim: White Shroud is a reference to the death shroud it says awaits Islamic State fighters responsible for crimes against the Syrian people, said the group’s leader, Abu Aboud, in an interview via Skype. As the United States advances plans to train and equip the moderate opposition to President Bashar al-Assad as part of its strategy to tackle Islamic State [ISIS], the appearance of such groups shows how ISIS has generated new enemies on the ground. Abu Aboud, who declined to give his real name for security reasons, was a commander in an anti-Assad insurgent group crushed by the better armed and financed Islamic State as it seized almost full control of Deir al-Zor earlier this year. The small band he now leads is in no position to deal a major blow to Islamic State. But it does pose an extra challenge as the United States and its allies target ISIS in air strikes in both Syria and Iraq. The Syrian Observatory for Human Rights, which tracks the war, has recorded a rising number of attacks by gunmen on Islamic State targets in Deir al-Zor province. Together with Raqqa province further north, Deir al-Zor forms the bedrock of Islamic State’s influence in Syria. White Shroud shows no mercy to Islamic State: when it manages to abduct one of its members, it is only to “liquidate” him later on, said Abu Aboud. It operates in and around the town of Al Bukamal at the Iraqi border – an area of crucial importance to Islamic State [ISIS] as the link between the territory it controls in Syria and Iraq. White Shroud currently numbers 300 members, said Abu Aboud. “Eighty percent of the members of White Shroud did not take part in combat before (Islamic State) came. We trained them and they joined White Shroud because of the great oppression they felt after Islamic State took control,” said Abu Aboud. “Secrecy is the most important element of White Shroud’s work,” said Abu Aboud. The group comprises four-man “cells” that work independently of each other, Abu Aboud said. One of White Shroud’s biggest operations was an attack on an Islamic State position in Al Bukamal in which around 11 Islamic State fighters were killed, according to the Observatory and Abu Aboud. The U.S.-led air strikes are not making White Shroud’s job easier, said Abu Aboud. Where Islamic State fighters once used to gather in large numbers, they now move in small groups, often at night, using motor bikes. 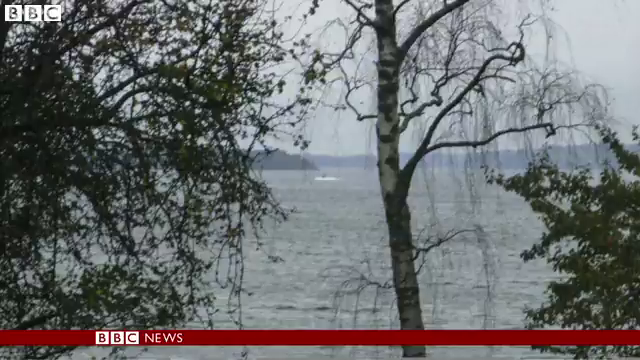 b) What does Sweden’s military think the unknown vessel sighted off Stockholm could be? c) What does the military think it was doing there? d) Why is Russia believed to be behind the incursion into Swedish waters? b) What is the population of Copenhagen? c) What percent of residents ride bikes to work? d) The government of Denmark is proud of its bicycle culture. In 2011, The Guardian reported: Copenhagen is one of the most bike-friendly cities in the world – 36% of its inhabitants cycle to work or school. The city has committed to increasing that figure to 50% by 2015. In 2013, The Copenhagen Post reported: “[City] Commission calls for more bicycle parking.” What factors have contributed to the bike parking problem Copenhagen is experiencing today? e) Do you think Denmark’s size or population impacts the amount of people who use bikes to get around the city? Explain your answer. b) How are the U.S.-led air strikes against ISIS in Syria making White Shroud’s job harder? c) Does this news report encourage you? Explain your answer. 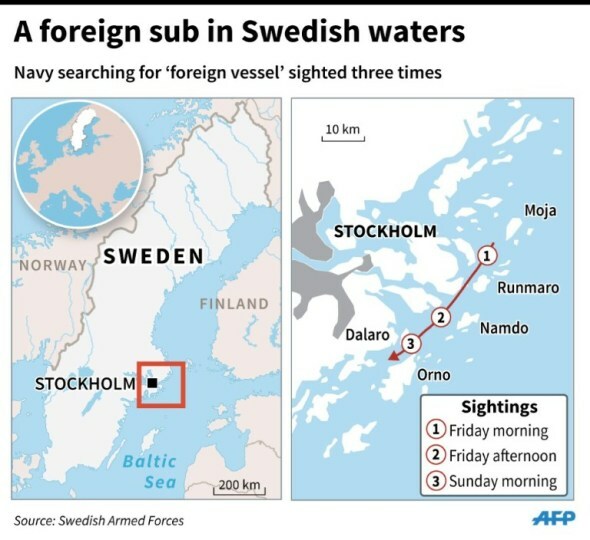 The Swedish military has said the initial information about suspicious underwater activity came from a trustworthy source, without providing details, and that more than 200 military personnel were involved in the search. The Swedish daily Svenska Dagbladet, citing unidentified sources with knowledge of the hunt, said it began after a radio transmission in Russian on an emergency frequency. Further encrypted radio traffic from a point in the archipelago and the enclave of Kaliningrad, home to the Russian Baltic fleet’s headquarters, was intercepted on Friday evening after the Swedish search started, the newspaper said. Grenstad said the armed forces had not received any information about a distress signal. The Russian Defense Ministry said on Sunday there were no emergencies in the Baltic involving its vessels. Russian submarines have been embarking on a new campaign of long-range missions, turning up as far away as the coast of California in sorties designed to test Western detection capability, and to see how the governments would react. It is a tactic which has not been used on this scale since Soviet days. According to a report published 25 years ago by the Rand think tank, entitled “Stranger than fiction: Soviet submarine operations in Swedish waters,” said that there were an average of 17 to 36 Soviet underwater operations in Swedish waters from 1980. In the Dutch city of Groningen [the Netherlands], the central train station has underground parking for 10,000 bikes, operated by a guard day and night. In Utrecht, a new cycle park over three floors at the central station has room for 4,300 bicycles – but it will soon be put in the shade by another facility to the east of the station, with room for 12,500. So will Copenhagen follow the Dutch example? “We try to steal as many good ideas as we can, and we have a very good working relationship with [city planners in] Holland,” says Andreas Roehl from Copenhagen city council, noncommittally. One Dutch idea on its way to Copenhagen is the removal of bikes that are parked illegally in congested areas. Leave your bike in the wrong place and you could find that it has been moved to nearby bicycle racks. A few years ago “bike-butlers” were introduced in some areas. The butlers pick up bicycles that have been knocked over, pump air into flat tyres and give the bike-chains a bit of oil, to thank people for parking properly. A plan to convert car parking spaces in residential areas into cycle-parking areas is also being considered. The Syrian Observatory for Human Rights says White Shroud is one of several small groups that have taken up arms against Islamic State in Deir al-Zor province in recent months and are picking off Islamic State fighters whenever they get the chance. They have all taken similarly menacing names. These include the “Phantom Brigade” and “The Brigade of the Angel of Death,” said Rami Abdulrahman, who runs the Observatory, which says it gathers information from sources on all sides of the conflict. One such group killed no fewer than 10 Islamic State fighters in a nighttime gun attack on a checkpoint in the town of Al Mayadin in Deir al-Zor province on Oct. 9, the Observatory reported. In a separate attack, a gunman on a motor bike opened fire on another Islamic State checkpoint. “There is an increase in their operations against Islamic State,” Abdulrahman said. Islamic State has made plenty of enemies during its conquest of Deir al-Zor, an oil-producing region. It expelled most other insurgent groups from Deir al-Zor in July, emboldened by rapid gains in Iraq where it seized the city of Mosul in June, capturing with it Iraqi army equipment that has been deployed in Syria. Mirroring its approach elsewhere, Islamic State has used crucifixions and decapitations to suppress all opposition in Deir al-Zor. It executed 700 members of one rebellious tribe, the Sheitaat, in August, the Observatory reported. Members of anti-Assad armed groups loosely referred to as the “Free Syrian Army” had the choice of fleeing, submitting to Islamic State rule, or death. The Nusra Front, al Qaeda’s official affiliate in Deir al-Zor, withdrew from the province.